We’ll try to do some questions on the board today. Please make sure you review all of problems on your own and ask if you have any questions. If you’re unsure of any solutions here, please see Chapter 22 in your textbook – it provides detailed explanations and examples. Some notes about Friday’s Exam. 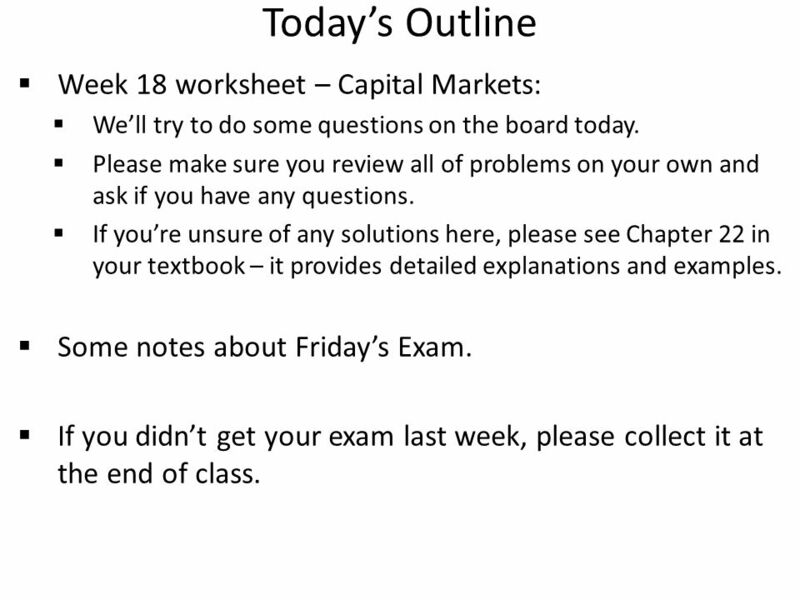 If you didn’t get your exam last week, please collect it at the end of class. 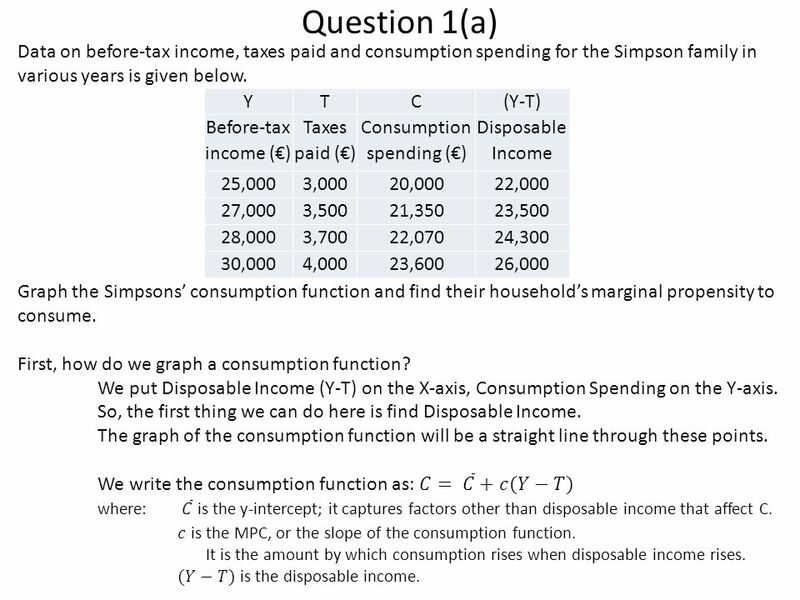 3 Question 1(a) Data on before-tax income, taxes paid and consumption spending for the Simpson family in various years is given below. Y T C (Y-T) Before-tax income (€) Taxes paid (€) Consumption spending (€) Disposable Income 25,000 3,000 20,000 22,000 27,000 3,500 21,350 23,500 28,000 3,700 22,070 24,300 30,000 4,000 23,600 26,000 Y T C (Y-T) Before-tax income (€) Taxes paid (€) Consumption spending (€) Disposable Income 25,000 3,000 20,000 27,000 3,500 21,350 28,000 3,700 22,070 30,000 4,000 23,600 Before-tax income (€) Taxes paid (€) Consumption spending (€) 25,000 3,000 20,000 27,000 3,500 21,350 28,000 3,700 22,070 30,000 4,000 23,600 Graph the Simpsons’ consumption function and find their household’s marginal propensity to consume. First, how do we graph a consumption function? We put Disposable Income (Y-T) on the X-axis, Consumption Spending on the Y-axis. So, the first thing we can do here is find Disposable Income. The graph of the consumption function will be a straight line through these points. We write the consumption function as: 𝐶= 𝐶 +𝑐(𝑌−𝑇) where:	𝐶 is the y-intercept; it captures factors other than disposable income that affect C. 𝑐 is the MPC, or the slope of the consumption function. It is the amount by which consumption rises when disposable income rises. (𝑌−𝑇) is the disposable income. 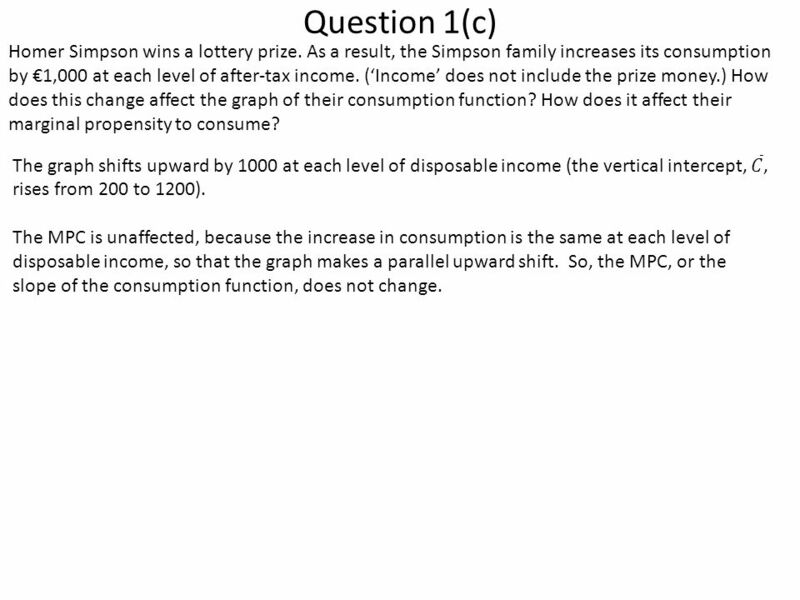 Question 1(a) Graph the Simpsons’ consumption function and find their household’s marginal propensity to consume. What is the marginal propensity to consume? We know that the MPC is the slope of our consumption function, so we can find it by taking the change in Consumption Spending divided by the change in Disposable Income. Before-tax income (€) Taxes paid (€) Consumption spending (€) Disposable Income 25,000 3,000 20,000 22,000 27,000 3,500 21,350 23,500 28,000 3,700 22,070 24,300 30,000 4,000 23,600 26,000 If disposable income increases from 22,000 to 23,500, a rise of 1500, consumption rises by 1350. Since 1350/1500 = 0.9, it looks like the MPC is 0.9. Can we write the Consumption Function out using the 𝐶= 𝐶 +𝑐(𝑌−𝑇) format? To do this, we need to find the intercept of the consumption function, 𝐶 . To find 𝐶 , we can plug into the equation any of the numerical combinations of consumption and disposable income given above. For example, if we set C = 20,000 and Y-T = 22,000, We get 20,000= 𝐶 +0.9(22,000), solving for 𝐶 , we get: 𝐶 =200. 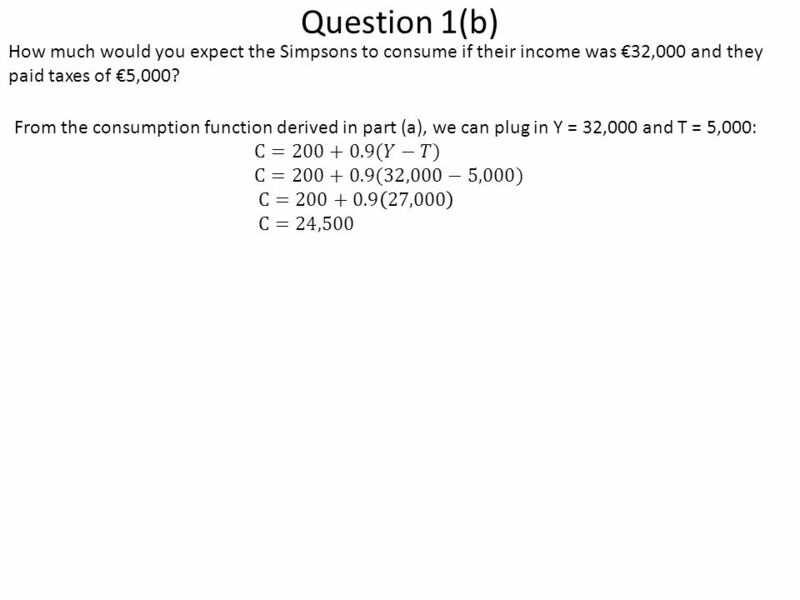 So the consumption function for the Simpson’s is C= (𝑌−𝑇). 6 Question 1(c) Homer Simpson wins a lottery prize. As a result, the Simpson family increases its consumption by €1,000 at each level of after-tax income. (‘Income’ does not include the prize money.) How does this change affect the graph of their consumption function? How does it affect their marginal propensity to consume? . The graph shifts upward by 1000 at each level of disposable income (the vertical intercept, 𝐶 , rises from 200 to 1200). The MPC is unaffected, because the increase in consumption is the same at each level of disposable income, so that the graph makes a parallel upward shift. So, the MPC, or the slope of the consumption function, does not change. consumption function is C = 1, (Y  T), IP = 1,000, G = 500, NX = 0 and T = 600. 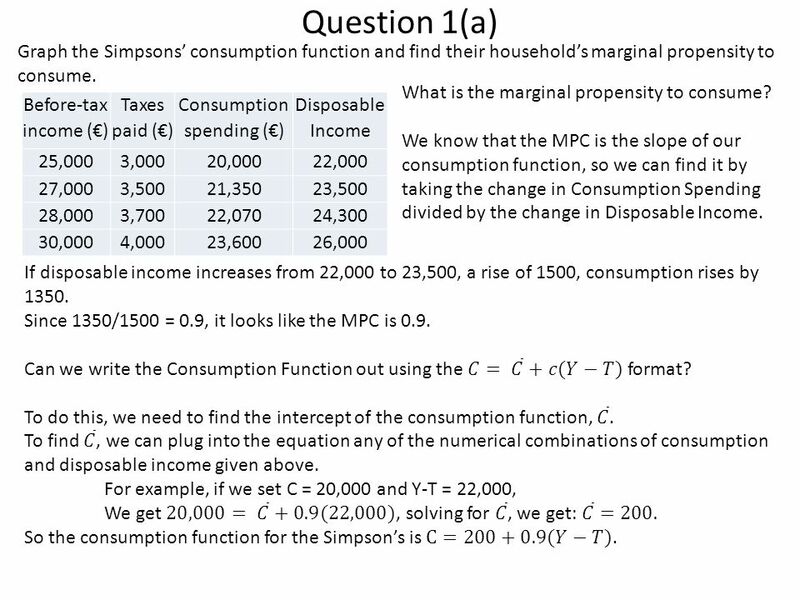 And MPC = c = 0.75 Find the values of: The income-expenditure multiplier. 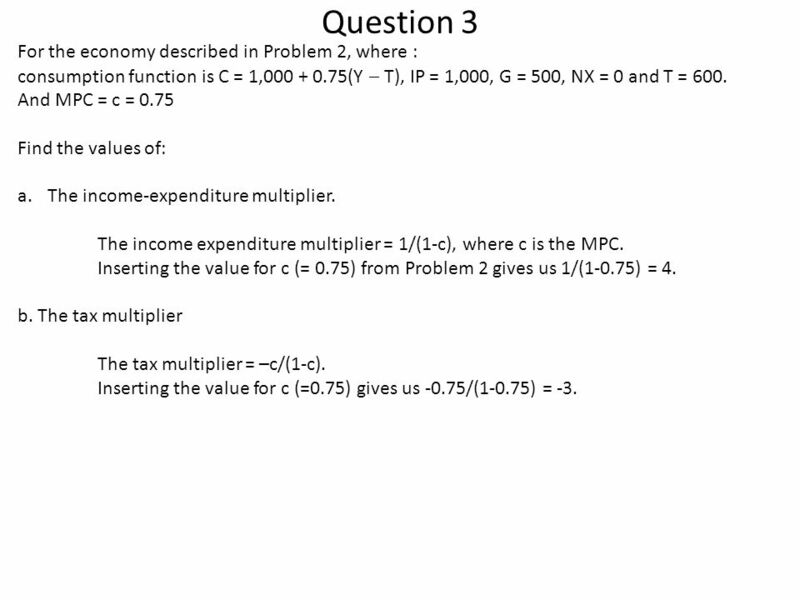 The income expenditure multiplier = 1/(1-c), where c is the MPC. Inserting the value for c (= 0.75) from Problem 2 gives us 1/(1-0.75) = 4. b. 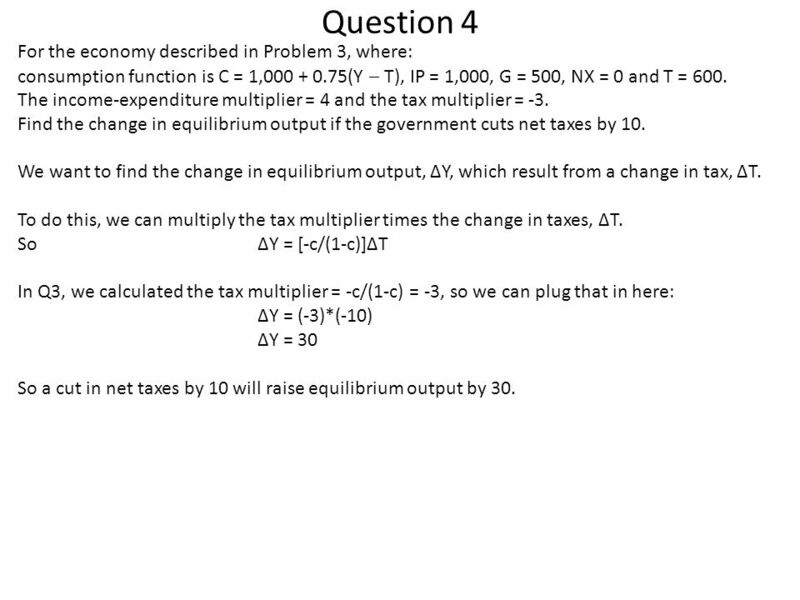 The tax multiplier The tax multiplier = –c/(1-c). Inserting the value for c (=0.75) gives us -0.75/(1-0.75) = -3.
consumption function is C = 1, (Y  T), IP = 1,000, G = 500, NX = 0 and T = 600. The income-expenditure multiplier = 4 and the tax multiplier = -3. 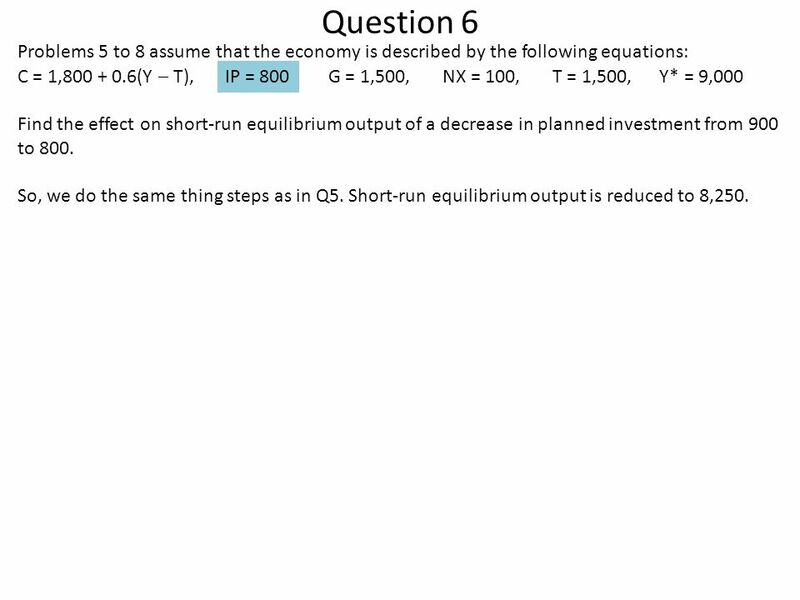 Find the change in equilibrium output if the government cuts net taxes by 10. We want to find the change in equilibrium output, ΔY, which result from a change in tax, ΔT. To do this, we can multiply the tax multiplier times the change in taxes, ΔT. So ΔY = [-c/(1-c)]ΔT In Q3, we calculated the tax multiplier = -c/(1-c) = -3, so we can plug that in here: ΔY = (-3)*(-10) ΔY = 30 So a cut in net taxes by 10 will raise equilibrium output by 30. Note: The taxes are reduced by 10. They are not reduced by 10%. So taxes go from 600 to 590. 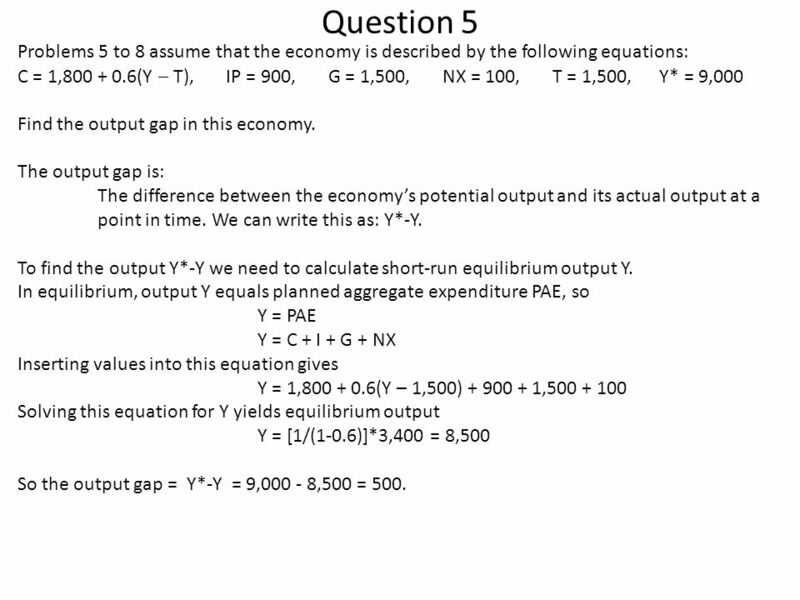 10 Question 5 Problems 5 to 8 assume that the economy is described by the following equations: C = 1, (Y  T), IP = 900, G = 1,500, NX = 100, T = 1,500, Y* = 9,000 Find the output gap in this economy. The output gap is: The difference between the economy’s potential output and its actual output at a point in time. We can write this as: Y*-Y. 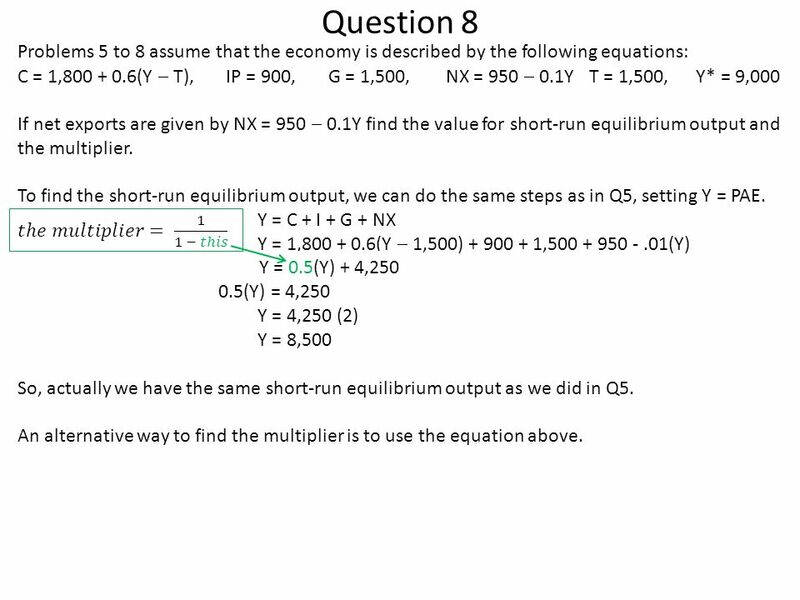 To find the output Y*-Y we need to calculate short-run equilibrium output Y. 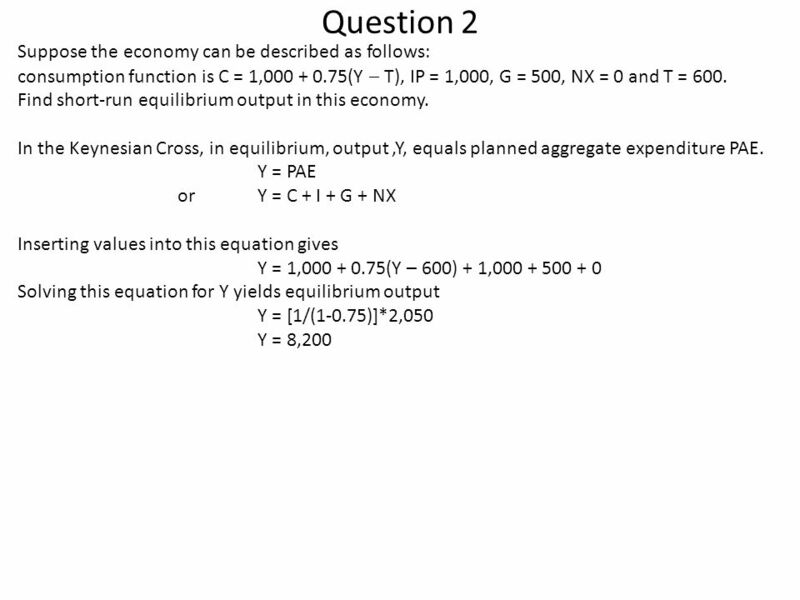 In equilibrium, output Y equals planned aggregate expenditure PAE, so Y = PAE Y = C + I + G + NX Inserting values into this equation gives Y = 1, (Y – 1,500) , Solving this equation for Y yields equilibrium output Y = [1/(1-0.6)]*3,400 = 8,500 So the output gap = Y*-Y = 9, ,500 = 500. 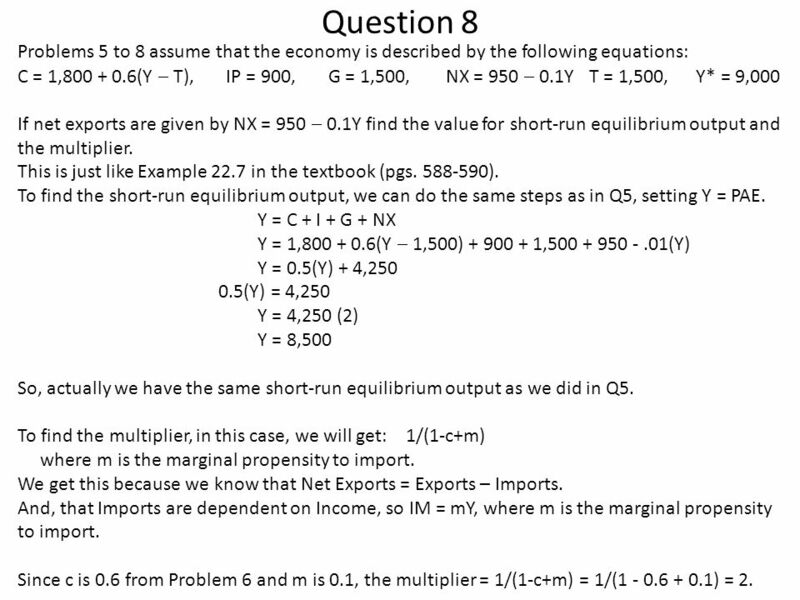 12 Question 7 Problems 5 to 8 assume that the economy is described by the following equations: C = 1, (Y  T), IP = 900, G = 1,500, NX = 100, T = 1,500, Y* = 9,000 Show the determination of short-run equilibrium output for this economy using the Keynesian cross diagram. 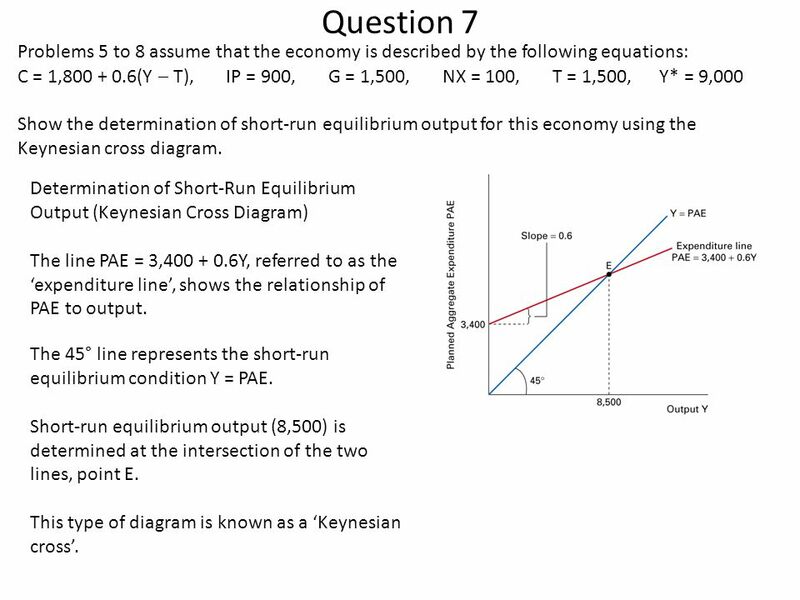 Determination of Short-Run Equilibrium Output (Keynesian Cross Diagram) The line PAE = 3, Y, referred to as the ‘expenditure line’, shows the relationship of PAE to output. The 45° line represents the short-run equilibrium condition Y = PAE. Short-run equilibrium output (8,500) is determined at the intersection of the two lines, point E. This type of diagram is known as a ‘Keynesian cross’. What to know: Check your timetable for Exam time and location. 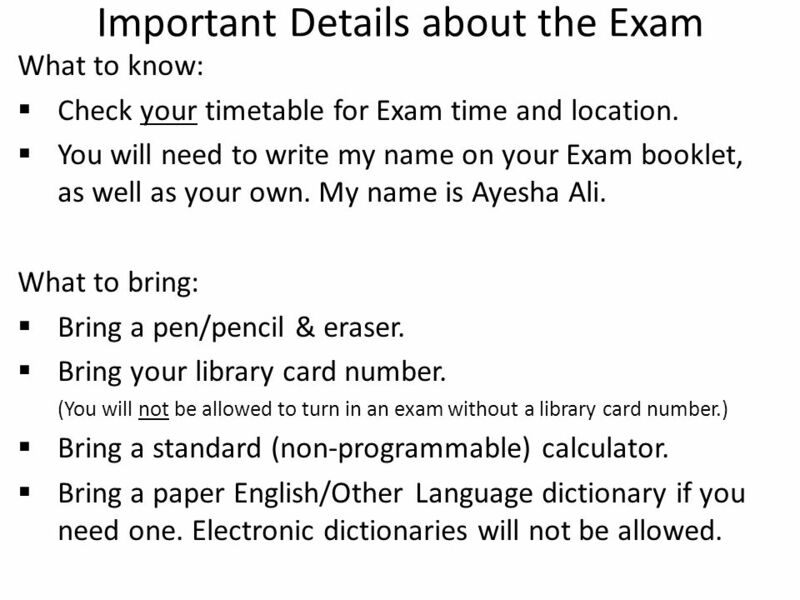 You will need to write my name on your Exam booklet, as well as your own. My name is Ayesha Ali. What to bring: Bring a pen/pencil & eraser. Bring your library card number. (You will not be allowed to turn in an exam without a library card number.) Bring a standard (non-programmable) calculator. Bring a paper English/Other Language dictionary if you need one. Electronic dictionaries will not be allowed. Chapter 23 in the Textbook Please me by Saturday if you’d like me to go over any Exam questions/solutions in class next week. Exam is on Friday this week – Tutors have 4 weeks to complete marking The office will probably take a week or two for processing So, if there are no problems at all, you should get your exam results back in roughly 5 weeks. Please be patient and work hard in the meantime. Good luck! Download ppt "office hours: 8:00AM – 8:50AM tuesdays LUMS C85"
13 EXPENDITURE MULTIPLIERS: THE KEYNESIAN MODEL CHAPTER. © © The McGraw-Hill Companies, Aggregate output in the short run Potential output –the output the economy would produce if all factors of production. 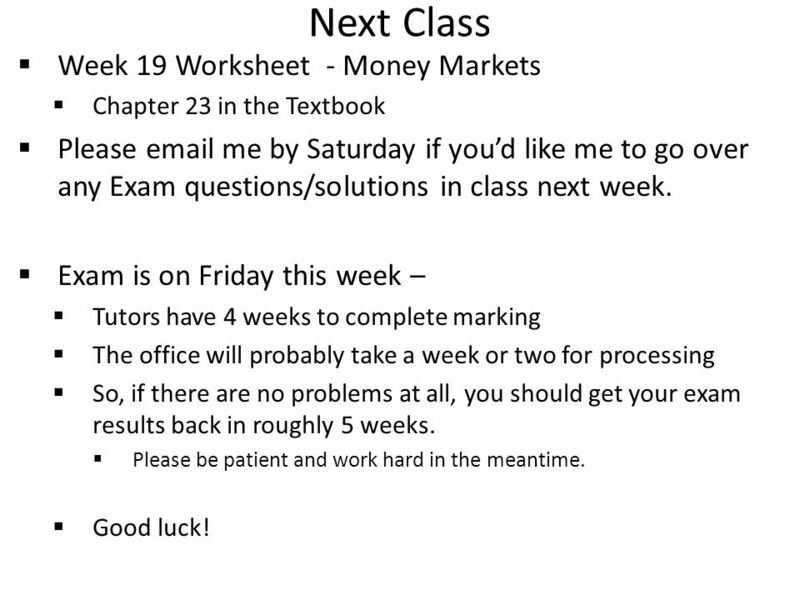 ECON 100 Tutorial: Week 23 office hours: 2:00PM to 3:00PM tuesdays LUMS C85. Slide 1 Diploma Macro Paper 2 Monetary Macroeconomics Lecture 2 Aggregate demand: Consumption and the Keynesian Cross Mark Hayes. Copyright © 2002 by The McGraw-Hill Companies, Inc. All rights reserved. 9-1 CHAPTER 9 The Income-Expenditure Framework: Consumption and the Multiplier. 12.1 © 2005 Prentice Hall, Inc. Economics for Managers by Paul Farnham Chapter 12: Spending by Individuals, Firms, and Governments on Real Goods and Services. Motivation The Great Depression caused a rethinking of the Classical Theory of the macroeconomy. It could not explain: Drop in output by 30% from 1929. 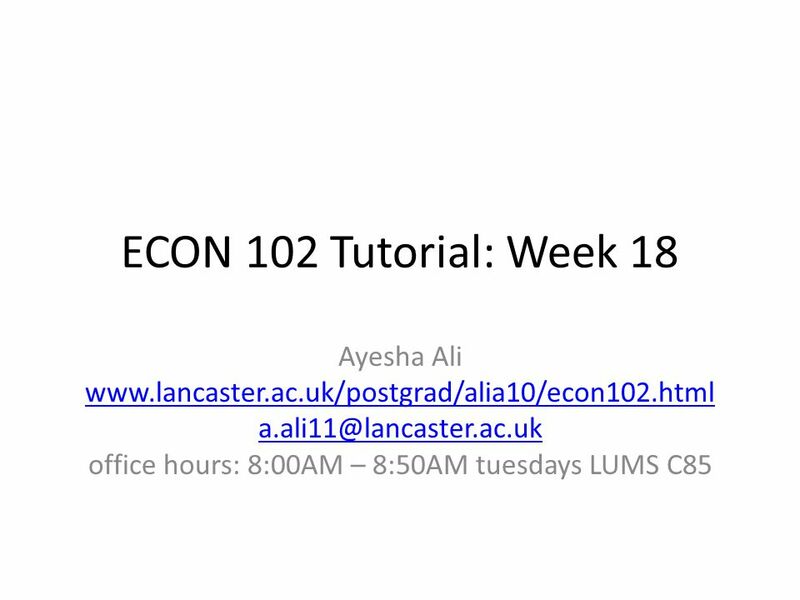 ECON 100 Tutorial: Week 13 office: LUMS C85.